Collaborating for the first time in horror fiction history, two brilliant award-winning and bestselling authors will come together to bring you a truly terrifying tale, complete with cover art by the legendary Steve Crisp. 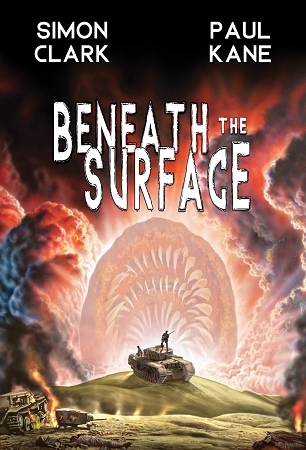 Simon Clark, author of Vampyrrhic, and The Night of the Triffids, and Paul Kane, author of Blood RED, Sherlock Holmes and the Servants of Hell are working together for the first time to bring you Beneath the Surface. Signed, numbered, and limited to just 250 copies worldwide, they bring to collectors an epic story of terror, heroism, survival, and many horrors. For the first time, collectors will be able to showcase these 1st edition copies, signed, hand-numbered, and extremely limited. This will sell out! Featuring four-colour laminated dust jacket, cover art by Steve Crisp, and printed on acid-free paper for your archive and legacy. Commemorate your love for horror and add this must-have to your collection today for just £49.95 for the Signed & Lettered Remarqued Hardcover or only £24.95 Signed & Numbered Limited Hardcover. The Second World War, and in the aftermath of a bloody desert skirmish survivors from both sides find themselves facing yet another battle: a battle just to stay alive. Not simply because they are in the middle of nowhere, with hardly any supplies, but because they are being hunted by something that has made the desert its home. A monstrous thing with a taste for human flesh, that will not stop until either they are dead or it is. As the soldiers begin to discover that they are not so dissimilar beneath their uniforms, they are also starting to realise that there is something else beneath the surface of the sand. Something no-one has ever seen before. Something deadly, dangerous and extremely hard to kill. . . From the imaginations of award-winning and bestselling authors Simon Clark (Vampyrrhic, The Night of the Triffids) and Paul Kane (Blood RED, Sherlock Holmes and the Servants of Hell) writing together for the first time, comes a tale of terror and heroism, of survival and horror. A tale that will stay with you, get under your skin and remain beneath the surface for a long time to come. Complete with cover art by the legendary Steve Crisp (who provided the covers for Simon's first books, such as Nailed by the Heart and Blood Crazy) this is one collectors' item you won't want to miss!